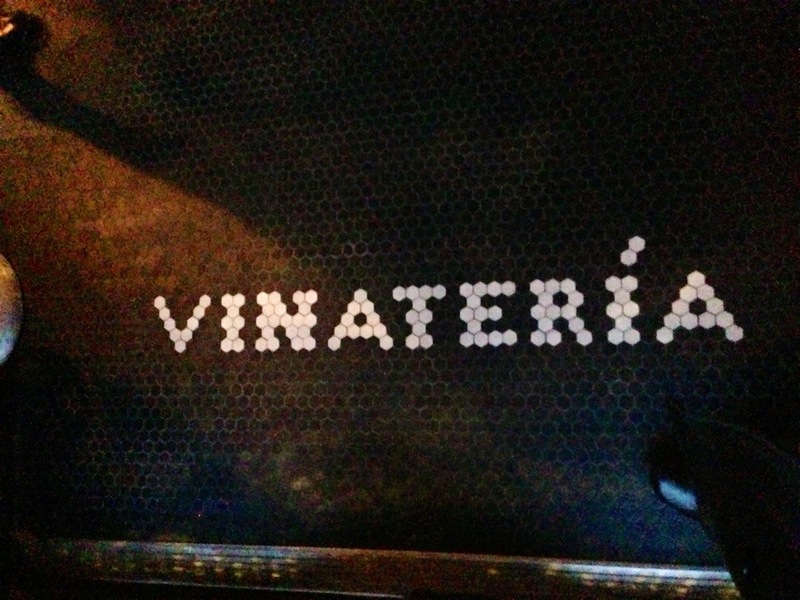 Vinatería is located at 2211 Frederick Douglass Blvd at 119th Street. 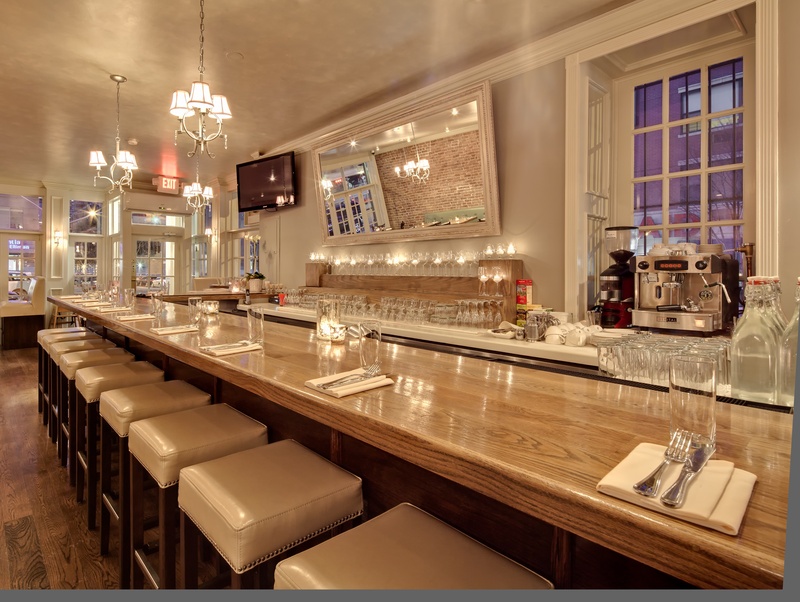 For reservations, call 212-662-8462. If you like the food, service and ambiance at Cantina in Harlem, then you may like the owner of Cantina’s next venture in Harlem? 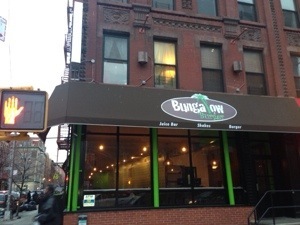 It’s called Bungalow Burger and Lounge and it’s located on 127th and Frederick Douglass Blvd. 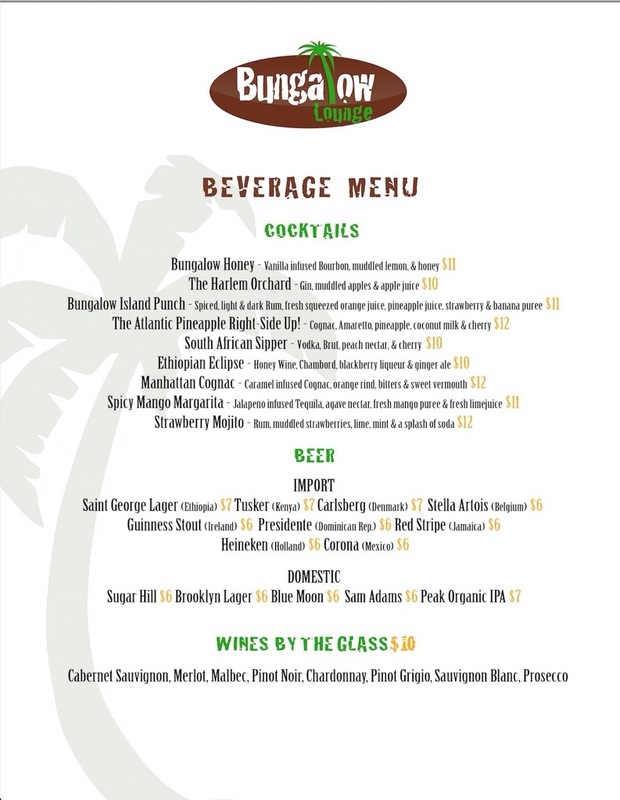 The new Harlem restaurant, which will offer burgers/sliders, shakes and a juice bar, opens this Thursday, January 9th and HarlemGal Inc has the menus below for your viewing. 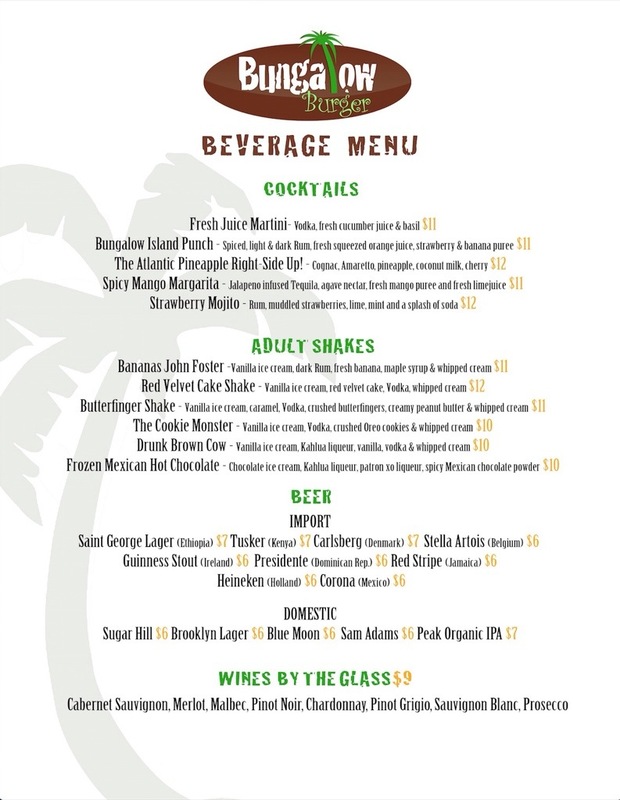 All items listed on the menus will be available this Thursday, according to the owner. Bungalow Burger and Lounge is set up into three areas, counter, lounge and dining with the counter and dining located in the upper level and the lounge in the lower level. 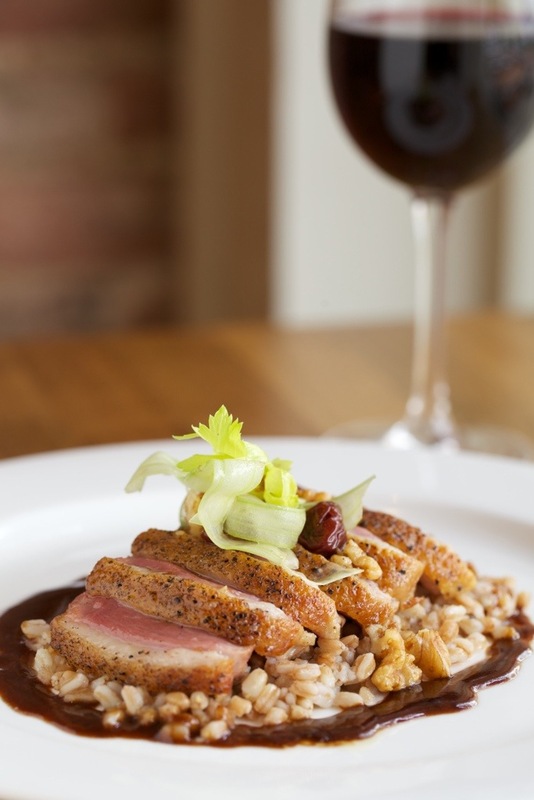 The counter menu opens at 11:30 am, lounge menu starts at 8 pm and the dining room menu starts at 4 pm. So if you’re interested in checking out a new Harlem restaurant this week, stop by Bungalow Burger and Lounge on FDB and 127th this Thursday. 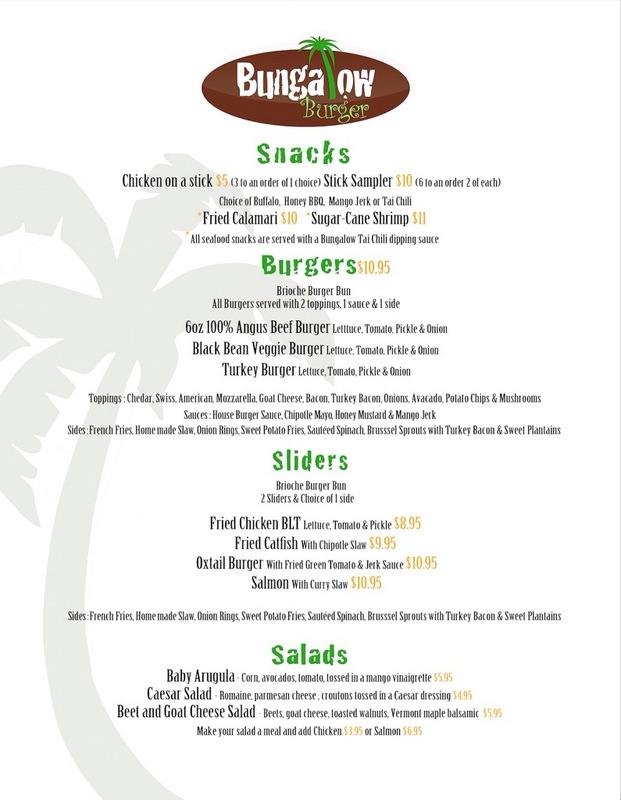 But first, view the menus below so you can figure out what you want to order! The holiday season is upon us, Harlem! Do you have special plans? Lido Italian Restaurant and Bar on 117th Street and Frederick Douglass is offering wine and dinner tastings during the holidays! Interested participants can schedule a wine and tasting event with friends and family or hold a company holiday party at Lido Harlem as well! Your special event can include history, grapes and other important wine facts. For example, discover why certain foods pair better than others with your wine. Sommelier, Andrea Wobensmith will lead the tasting in a fun and relaxed setting. Lido Harlem is offering 4 and 5 course pairings for 10 or more individuals. Another chain restaurant is opening in Harlem. Red Lobster has sent out the invites announcing they are having a ribbon-cutting ceremony this coming Monday in honor of its Harlem branch opening to the public on the same day at 11 am. 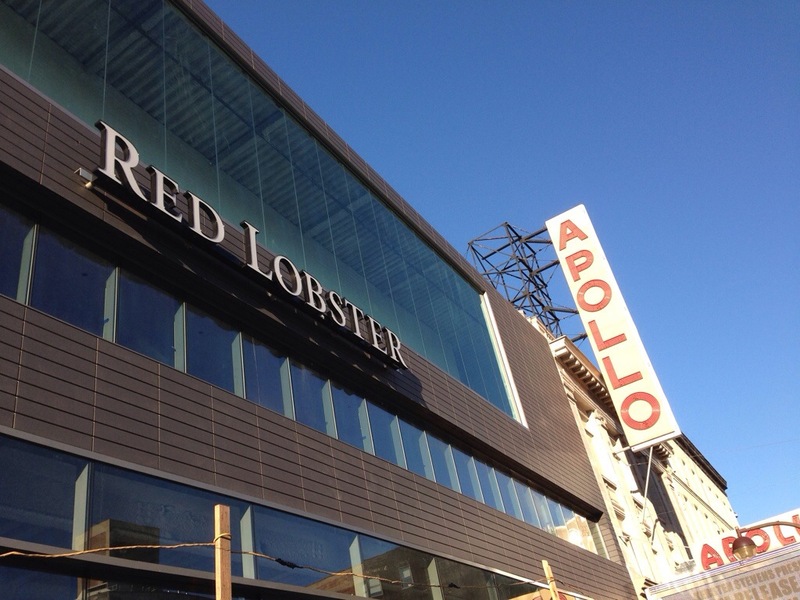 The Harlem Red Lobster is located next to the historic Apollo Theater. The ribbon-cutting ceremony will include a performance by the Veterans of the 369th Sargent Association, remarks from Red Lobster executives and local officials, and Artist Alethia Brown’s work will be showcased in the RL lounge commissioned by the Harlem Arts Alliance. 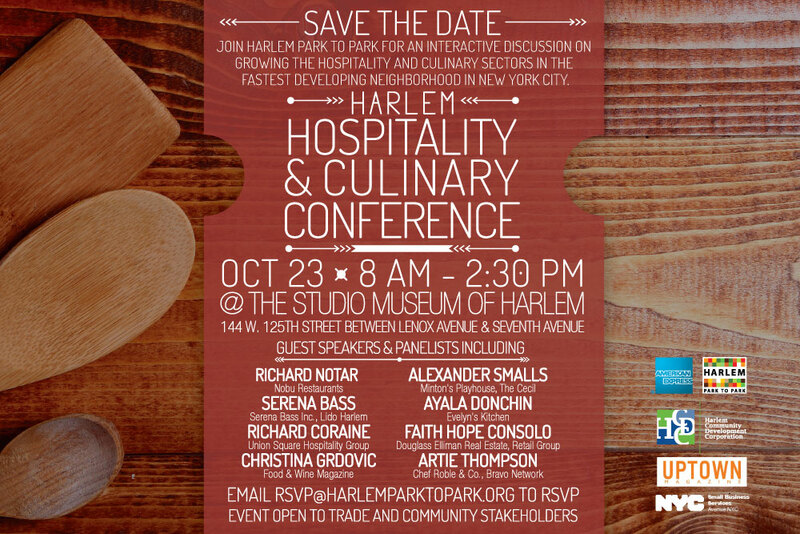 The second annual Harlem Hospitality and Culinary Conference, featuring top industry tastemakers and influencers from the worlds of food, hotels, nightlife and real estate, will be happening Wednesday, October 23, from 8 am – 2:30 pm, at The Studio Museum in Harlem. Panelists this year include Richard Notar, Managing Partner, Nobu Restaurants, Serena Bass, Celebrity Caterer, Serena Bass Inc., Executive Chef, Lido Harlem, Richard Coraine, Managing Partner, Union Square Hospitality Group, Christina Grdovic, VP and Publisher, Food & Wine Magazine, Jennifer Baum, Founder, Bullfrog & Baum, Adam Saper, Managing Partner, Eataly New York, Artie Thompson, Catering Director, Chef Roble & Co./Bravo TV and Faith Hope Consolo, Chairman, Retail Group, Douglas Elliman Real Estate, among others. The conference, will explore strategies for developing and sustaining successful businesses in Harlem within these key industries. Topics will include Game Changers: Winning Strategies in the Culinary Industry Today; Branding: Creative Strategy Behind a Successful Culinary Brand; Homegrown Restaurants/Eateries: Thriving as David in the Land of Goliath; Event Catering: Untapped Potential for Restaurant/Culinary Business Growth; Artisanal Foods: Creating a Successful Neighborhood/Regional Culinary Brand; Cocktails and Nightlife: What Makes a Great Bar? ; and NYC’s Wake Up Call: Meeting Growing Demand for Harlem Hotels. See details below on how to attend. And read more here about Harlem restaurants. According to the 125th Street Business Improvement District, the Red Lobster that is coming to 125th Street next to the Apollo Theater is now hiring. 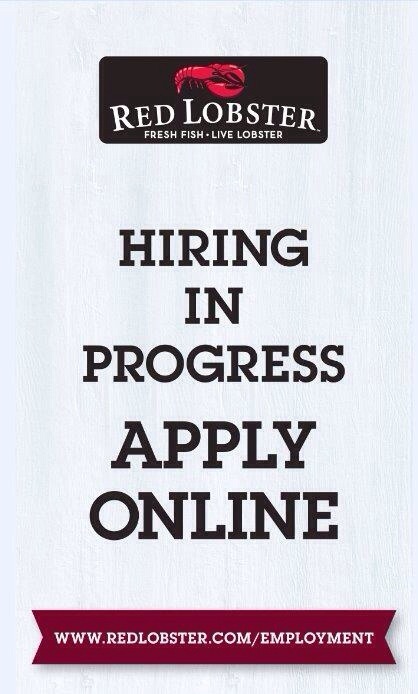 Interested participants should go to www.redlobster.com/employment to seek out employment. Tagged 125th street, Harlem, Harlem bloggers, Harlem Blogs, Harlem Restaurants, Jobs, Red Lobster, Red Lobster Harlem, The Apollo Theater. 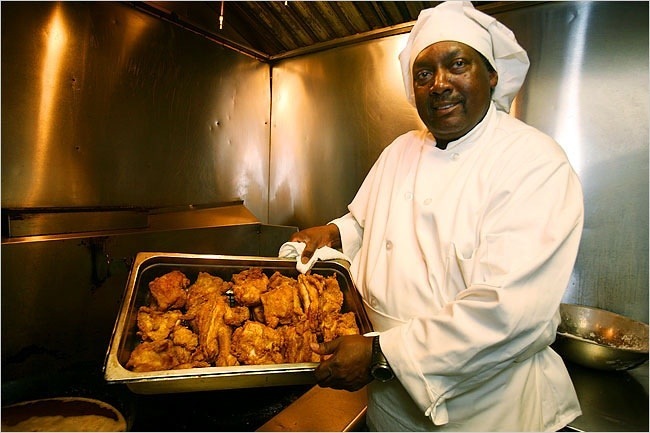 To read the full article on The 10 Best Fried Chickens in NYC, go here. 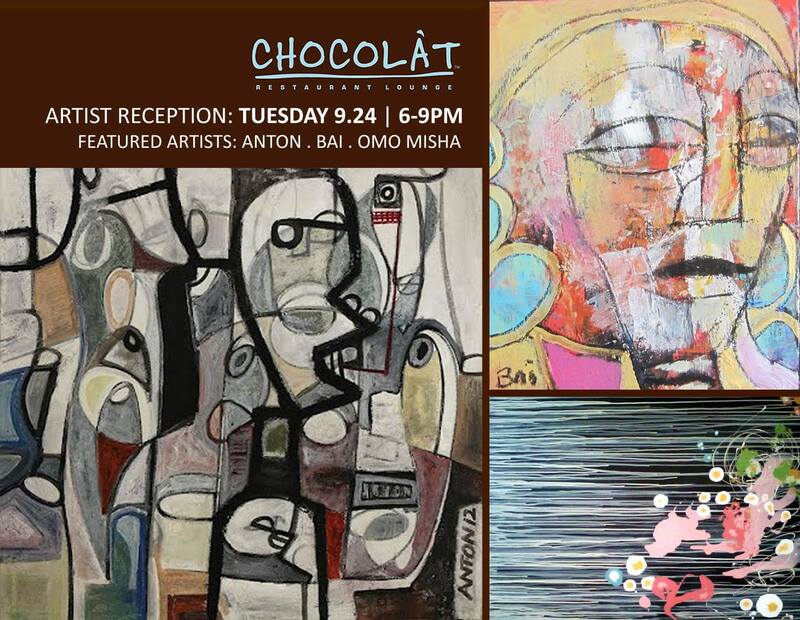 Next Tuesday, September 24th from 6-9 pm, Chocolat Restaurant in Harlem will be hosting an intimate reception for two exhibiting artists, Anton and Bai. Some of Anton and Bai’s paintings and mixed-media work has already been on view at Chocolat this past summer. At the Sept. 24th artist reception, guests can meet and socialize with the artists and see more of their creative works. To learn more about the art at Chocolat go here. 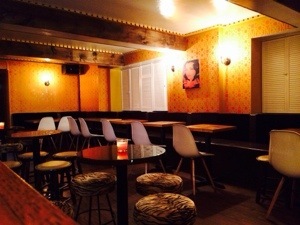 Or stop by Chocolat in Harlem at 2217-23 Frederick Douglass Blvd. 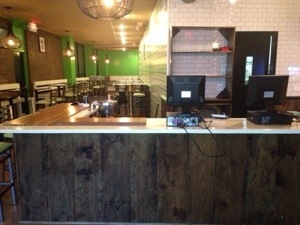 at the corner of 120th St. or call at (212) 222-4545. For those of us Harlemites who could not travel to Italy this past summer, can now escape to Italy’s wine country in Harlem. Lido Italian Restaurant and Bar on 117th Street and FDB is hosting another a wine event in September. On Tuesday, September 24th from 7:30-9:30 pm, Lido Harlem is offering a five course wine tasting dinner featuring Italian wines and food. Wine educator and sommelier, Andrea Wobensmith will once again take guests through the wines and help them learn more about pairing tips, grapes, differences in growing practices and more, all in an intimate and relaxed setting. Wobensmith has been teaching wine classes for over 7 years. Her passion began after visiting Italy and tasting wines throughout the countryside. Wobensmith earned her Sommelier Certificate with the Sommelier Society of America. The price is $105 per person plus tax and gratuity. 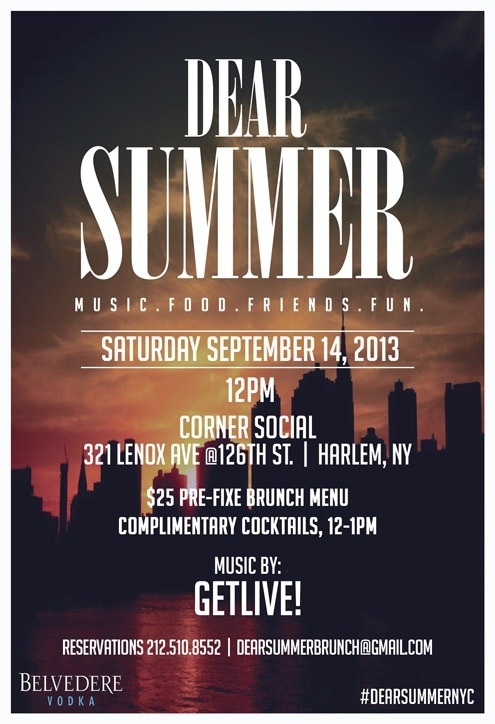 Space is limited, call for reservations at: 646-490-8575 or 917-733-9413.